This tradition for me continues now with my own family some 50 years later, with a few evolutions. Twenty years ago, (crazy I can say that!) the decision was made that ALL party goers -- young and old -- must have Christmas PJs! And the more goofy and silly the pajamas the better. Each year, my family still gathers for a festive Christmas dinner. Once we’ve enjoyed our meal, the whole family opens and changes into their new Christmas pajamas for the evening. It’s then that the featured event for the night begins...a PJ fashion show. We show off our PJs, complete with accessories, music, an MC and even a runway! Over the years we’ve accumulated quite the assortment of accessories for our PJs -- which may I add are AMAZING! They include cat glasses, boas, gloves, an air bomber hat, a sombrero, just to name a few. To create our fashion show, the entryway of our home is made into a runway out of butcher paper, Christmas lights and tinsel. Next, we turn on some bumping Christmas music and strut our stuff down the runway in our new Christmas PJs. Yes, we go all out! Of course, we have a photographer to capture each special moment for more laughter and enjoyment later. This is typically Tom. Each of us does several prances down the runway each time, changing up the accessories a bit for a different look. The family cheers each other on, while dancing and clapping. Needless to say the grand kids love it! And truthfully so do all of the adults! This simple tradition has provided my family a lifetime of memories we talk about often. Not only with my immediate family, but with my cousins, aunts and uncles too. Since we only see each other once or twice a year, this tradition is something we all share and can reach for anytime we’re together to create and maintain our connection with each other. Our special memories gives us a place to say, “Hey, do you remember when...?”. And immediately we all journey back to another time and place and relive some great moments together. The power of traditions in families creates impactful moments. And they carry the power to connect us to each other for a lifetime. What are the traditions that create connection for you in your family? Traditions are not silly, they’re actually really important. If you have strong traditions in your family, give thanks for them and make the effort to keep them going and allow them to evolve. If you don’t currently have traditions in your family, decide to create some now. Start with one or two ideas that seem fun and really speak to you. And if by chance you have a blended family, intentionally use a mix of each family’s traditions to create a new version you can call your own. Did you know that more than 45% of the WORLD’s population celebrates Christmas? And 86% of us say our favorite part is spending time with family and friends -- with only 2% saying their favorite part are the presents! This shows us that we humans love to share and be together. We humans love to share and be together, and the traditions we carry on keeps our connections with each other ALIVE! And let’s just take a moment to call out the “elephant” that might be in your living room. It may be the case that you're feeling unsettled in your relationship this holiday season. This might be a really rocky time for you and your partner. The last thing you may be thinking about are holiday traditions. Truth be told, you may be wondering if your relationship will survive the coming new year. We want you to know it’s all ok. The reality is relationships have seasons and we all experience hard times with our partners. But here’s another undeniable truth: all any of us have is this present moment. Yes, change may be on the horizon in your relationship. But for now, do your best to set the challenges of the day on the shelf and give yourself and those you love the gift of this present moment. Let's do our best to create more moments that matter this holiday season. We encourage you to take this special time to be with your family and friends, and we’re going to do the same. This will be our last post for 2017. We’ll be back with more for you beginning January 11, and might we add, with a surprise! Here’s a hint: It is the inspiration that started Lease On Love to begin with, and the time has come to share it with this wonderful community of Lease On Lovers. Happy Holidays to you and your family! We wish for you a very prosperous, prosperous, prosperous New Year filled with the abundance of love and connection. 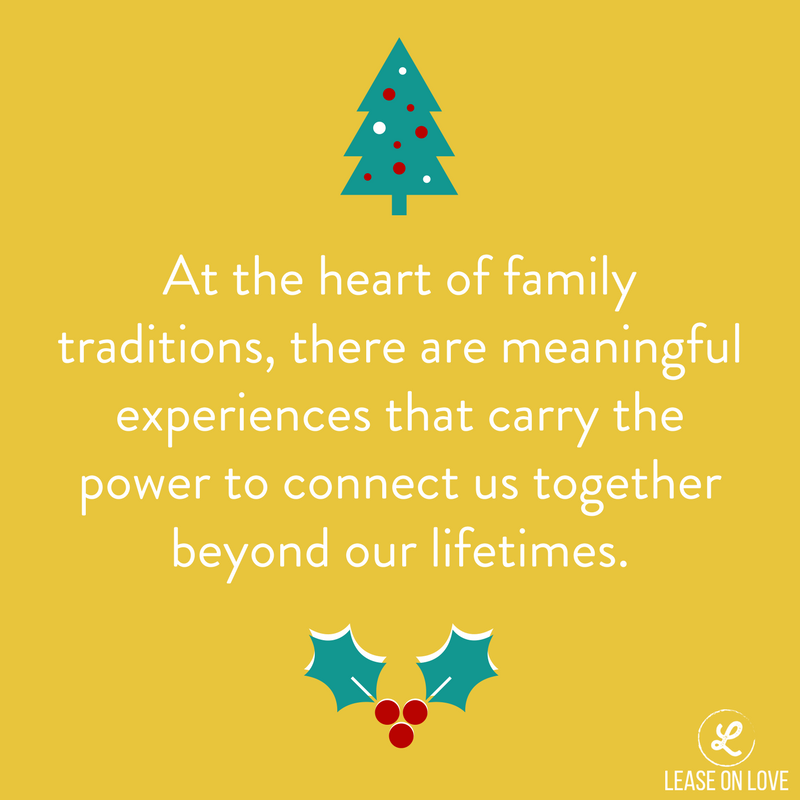 Now over to you -- What are some of your favorite family traditions? We would love for you to share them with us and our community in the comments below. After all, we can all use a bit of inspiration right?! Making decorations has been part of the holiday fun for us for many years, so we thought it would be fun to share this tradition with you. And to make it even better, all the DIY ideas shared here have been purchased from the dollar store. So come on, make something cute for the tree, a gift for your neighbors, or just for something fun to do with the kids or grandkids. There is something to DIY for everyone. Baking is another wonderful holiday tradition. Sometimes it can be hard to start when you don't have any famous family recipes. Our daughter Brooke made these Apple Cheesecake Bars for her Thanksgiving spread and they turned out so delicious. Let us know if you try them!